A commercial-off-the-shelf (COTS) approach to embedded computing designs for avionics applications is becoming more practical. Responding to the growth in existing safety-critical system complexity, the DoD and government community have created the command, control, communications, computer, intelligence, surveillance and reconnaissance (C4ISR) program. The program aims to bring successful intelligence warfare to the Air Force and other branches of the service. Efforts include the Sensor Open System Architecture (SOSA) initiative, a collaborative effort between the Department of Defense (DoD) and the embedded community which creates modular open systems architecture specifications, allowing the reuse of key sensor components and maximizing C4ISR sub-system, system, and platform re-configurability. Abaco Systems' SBC329 single board computer uses a 3U VPX open systems architecture. In support of the C4ISR Modular Open Suite of Standards (CMOSS), a 3U OpenVPX convergence development platform from Elma Electronic including new SOSA slot profiles was created to host a faster timing card and a new single-board computer from Curtiss-Wright. The single-board computer is Curtiss-Wright’s fifth-generation Intel Core i7-based VPX3-1259 3U OpenVPX module — an upgrade to the system’s earlier fourth-generation Intel Core i7-based VPX3-1258 card. The timing card is Curtiss-Wright’s VPX3-673 3U OpenVPX A-PNT module and serves as a low-skew clock master powered by a GPS-disciplined chip scale atomic clock with configurable clock reference sources and support for up to 16 synchronized clock outputs. The 12-slot 3U OpenVPX convergence development platform provides a 10GBase-KR board-to-board signaling with aggregated port speeds up to 40 gigs. The platform accommodates boards with the latest VITA 65.0-2017 slot profiles for target application development, and its enhanced development platform serves as a complete test environment to enable the integrated development of common, modular hardware architectures across critical C4ISR systems. Michael J. Hackert, a standards representative for the U.S. Naval Air Systems Command, told 2019 VITA Embedded Tech Trends attendees that these new standards are starting to gain traction and will receive substantial amounts of money in the near future. “It's the tip of the iceberg, and we are heading in that direction," Hackert told the ETT conference. One of ELMA Electronic's 48.4 solutions. A new single-board computer developed by Abaco Systems, designed with VITA standards, can be upgraded with a replacement board based on the latest Intel processor. 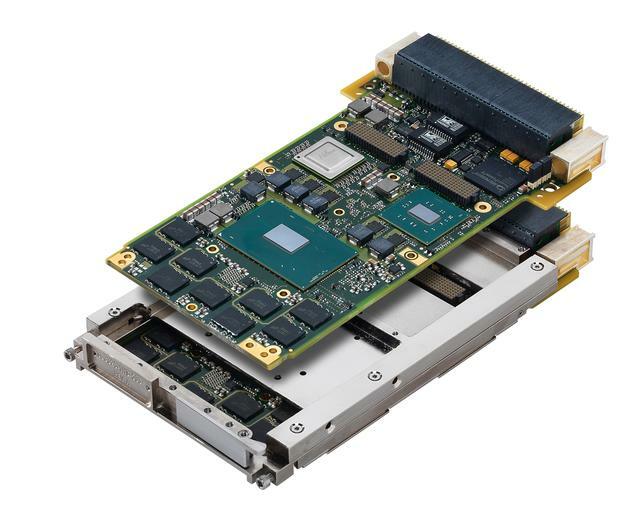 For example, the latest Intel Xeon E3-1505M or E3-1505L v6 quad-core CPU with integrated graphics and memory controller bring much more to Abaco Systems’ SBC329 Rugged 3U VPX board. On- and off-board tasks benefit from enhanced input and output bandwidth, made possible by the seventh-generation Intel Core processor platform technology teamed with the CM238 chipset and encompassing Intel TurboBoost Technology, along with Intel AVX 2.0 extensions and AES-NI instructions. Beyond generous input and output, developers will find graphics support for OpenCL 1.2, OpenGL 3.2 and DX11.1. Addressing the challenges of ever-increasing memory needs are the new single-board computer’s 32 gigabytes of flash memory and up to 16 gigabytes of DDR4 SDRAM with 512 kilobytes NVRAM. And with the never-ending need to offer superior security features, the SBC329 steps up to the plate with hardware-assisted security and TPM. Emphasizing flexibility, an on-board mezzanine expansion site is included. The board also features eight Gen3 ready PCIe lanes and rear I/O with gigabit ethernet ports, along with DVI/HDMI, SATA and communications ports. The computer also offers five levels of ruggedization, comes with AXIS and is deployed test software and runs Windows, Linux and VxWorks. In an effort to support future avionics development, an initiative has begun to define the next-generation space interconnect standard (NGSIS) for SpaceVPX and SpaceVPXLite. With backers including Honeywell, TE Connectivity, Boeing, Cisco, Amphenol, BAE Systems, Elma, the initiative is gaining momentum. Deployment of a SpaceVPX product took place in November 2018. NASA’s InSight spacecraft that landed on Mars was equipped with BAE Systems’ RAD750. Based on the RAD750 V2 or V3 processor, the RAD750 SpaceVPX single-board computer is equipped with RADNET SpW-RB4 bridge application standard. The product operates from minus 55 to 125 degrees Celsius. Higher VITA systems performance increases power consumption. 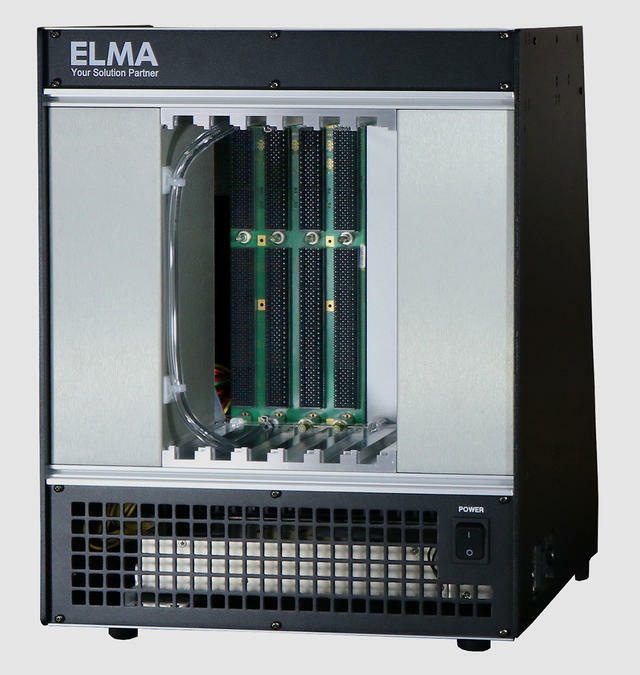 To increase cooling efficiency, Elma Electronic’s new OpenVPX development platform is designed to accommodate boards that require VITA 48.4 Liquid-Flow-Through (LFT) cooling. The standard establishes the mechanical design interface, outline and mounting requirements for a 6U VPX LFT-cooled plug-in module within associated sub-racks, while the connector layout remains common with VITA 46. This plug-in module uses liquid flowing through an integral heatsink of the module to cool the electronic components and circuit boards. The quick-disconnect coupling assemblies allow fluidic coupling to the chassis manifold. This self-contained VITA 48.4 LFT platform is designed to accept up to five 6U VPX plug-in modules on a one-inch pitch as well as either a built-in power supply or a plug-in VITA 62 power module. The liquid-to-air heat exchanger provides the required fluid for cooling and a flow indicator shows whether the fluid is circulating. Elsewhere, the SpaceABLE SM 50G and 150G optical transceivers from Reflex Photonics can support Internet-of-Space applications, communications satellites dependent upon maximizing throughput, and other deployments where the focus is on high bandwidth communication links and very dense input and output requirements. The transceivers’ suitability for these applications stems from a unique combination of features as well as Reflex Photonics’ approach. These optical transceivers can withstand radiation doses greater than 100 krad (Si) and the company insists on performing component pre-screening for each batch of transceivers intended for environments where radiation exposure is a factor. Testing of every device takes place according to ECSS processes and lot acceptance testing. Over a temperature range of minus 40 degrees Celsius to 100 degrees, performance is up to 12.5 gigabits per second per lane. At the same time, the device barely sips power, using only 85 mW/lane (<10 pJ per bit). “Avionics demand high safety standards and radiation resistance is a must for fiber optic applications in space,” said Noel Dube, CEO of Reflex Photonics, describing their new SpaceABLE technology. 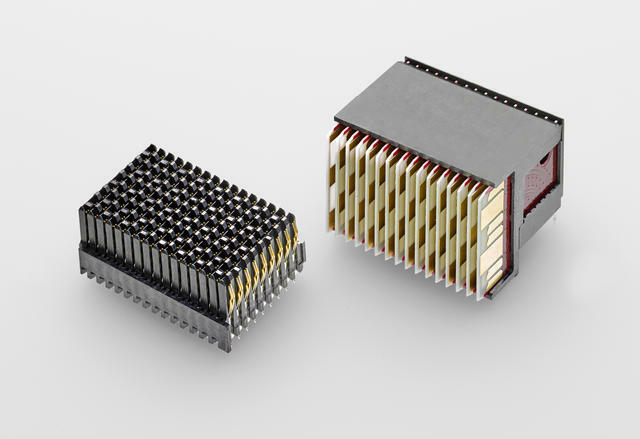 The next-generation connectors will be much denser than those that support embedded applications on airborne platforms today. TE Connectivity has created its multi-gig RT-3 VITA 46 VPX connector compliant high-pitch connectors to support more advanced backplane characteristics with greater bandwidth. The RT-3 can support data rates up to 25 Gbps and is backwards-compatible with the TE’s RT-2 connectors. Fourth-generation PCIe and 100G-base KR4 protocols are supported on the new connectors as well. Avionics systems demand higher levels of performance, safety and reliability. A VITA-based open architecture system brings a world of new benefits to users, allowing systems to easily be upgraded to the latest Intel processors on single-board computers. The SOSA standard will make sensor reconfiguration and reuse a reality. With the extension of benefits to avionics using SpaceVPX, airborne electronics will be fail-safe with redundancy. VITA standards continue to define an open path forward for systems, single-board computers, backplanes and components to speed up the adoption of COTS in avionics.